Madelin T. Zwerling is an Associate at Garfunkel Wild, P.C., which she joined in 2011. She is a member of the Personal Services and Estate Planning Practice Group, which advises clients in the preparation of wills and trusts, as well as in estate administration and gift planning for the preservation of family businesses and wealth upon death, and related tax matters. 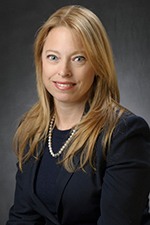 She is also a member of the Discharge Planning and Patient Rights and Elder Law Practice Group, and regularly represents hospitals in court proceedings concerning retention and treatment issues for psychiatric patients and assisted outpatient matters. Ms. Zwerling also is a member of the Employment Law Practice Group, which, among other functions, develops employee handbooks, policies and procedures and represents clients in a wide array of employment litigation matters, including matters before the New York State Division of Human Rights. Prior to joining the firm, Ms. Zwerling was an attorney whose primary areas of focus were real estate, trusts and estates and matrimonial law. Ms. Zwerling has devoted herself to pro bono work. In 2011, she was honored for her work on behalf of the Nassau County Coalition against Domestic Violence, an entity that provides legal assistance in matrimonial actions to victims of domestic abuse. She also served as an attorney for the Long Island Advocacy Center, an entity that is designed to provide individuals with various forms of assistance relating to the Individual with Disabilities Act, such as Special Education support and lay advocacy training. Ms. Zwerling also provided service as a court-appointed guardian through the Court Appointed Special Advocate (CASA) EAC Family Court Program in Nassau County. Ms. Zwerling is a graduate of New York University with a Bachelor of Science Degree in Finance. Following her graduation from New York University, she was employed in the financial services industry as an analyst and a corporate speechwriter. She later graduated from Touro College Jacob D. Fuchsberg Law Center in 1991 with honors, having finished near the top of her class. Ms. Zwerling also spent years as an educator, with a primary focus in teaching children with learning and emotional disabilities. She obtained multiple teaching certifications, in Special Education, Literacy, Business and Marketing and Elementary Education.